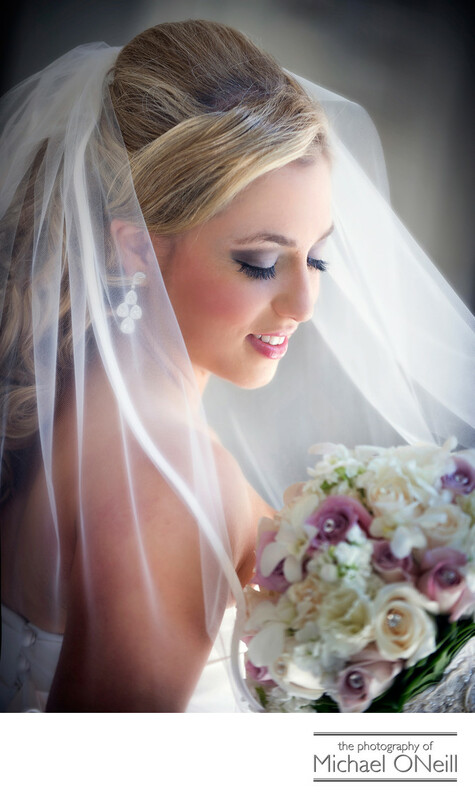 Here is a classic portrait of a bride taken early in her wedding day. She had just finished with her hairstylist and makeup artist. Her bridesmaids, cute little flower girls and parents were looking on as I captured this beautiful image. The soft light coming through the window in the hotel where she was getting ready cast a beautiful glow on this stunning bride. Soon we would leave the hotel room for the reveal, where her husband would see her in her wedding dress for the very first time. That took place in the amazing gardens of Planting Fields arboretum inOyster Bay, New York, one of the most popular destinations for wedding photography on Long Island. After creating lots of formal, fun, contemporary, casual photographs of the bride and groom, their bridal party and their families we headed off to the catering venue for their elegant marriage ceremony, cocktail hour and wedding reception. This all took place at The Carltun on the grounds of Eisenhower Park in East Meadow, NY. The Carltun is truly one of the finest catering venues anywhere in the Nassau County, Long Island and Greater New York NYC area. I have had lots of experience photographing weddings at The Carltun over the years. The interior spaces are absolutely breathtaking, the food is spectacular and the service is outstanding. The gardens at The Carltun are the perfect spot for an outdoor wedding ceremony. If you are planning a wedding celebration at The Carltun I welcome the opportunity to sit down with you and discuss all your plans and desires for your wedding day.